In honor of Force Friday II, Disney and Lucasfilm have released a new augmented-reality experience called "Find the Force." Happy Force Friday eve! The Force is strong with all the new "Star Wars" merchandise and other festivities that you can find in stores worldwide this Labor Day weekend (Sept. 1-3). The global event celebrates the upcoming release of "Star Wars: The Last Jedi" with the launch of new toys and other products inspired by this latest addition to the "Star Wars" saga. Retailers are also hosting special events and activities, like "midnight madness" store openings and exclusive gift giveaways. "Star Wars has always championed new technology, and we are excited that augmented reality will allow fans to experience the universe in a whole new way," Kathleen Kennedy, president of Lucasfilm, said in a statement. The new AR game can be launched directly from the "Star Wars" app. 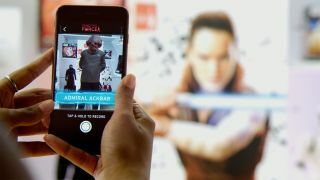 From there, you unlock new AR experiences by searching participating stores for pictures of characters with the "Find the Force" logo, then scan them with the camera on your phone. Find your favorite classic characters and meet new faces from "The Last Jedi." For every new character you scan, you'll receive a data chip. By earning chips, you can unlock more digital rewards within the app. Find out more about the AR experience by visiting www.starwars.com/findtheforce. You can also find a complete list of Force Friday events and participating retailers here.